You don't think it will actually happen. 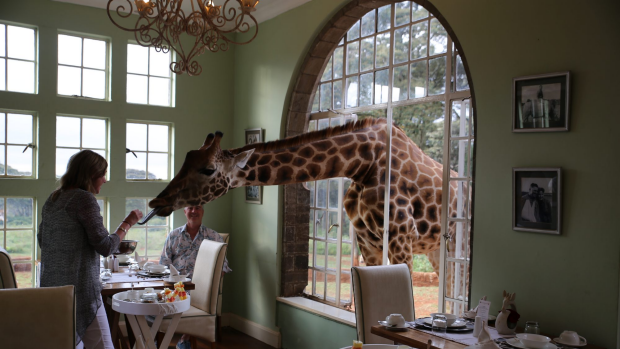 You've seen the photos on the website, you've seen the videos on Instagram, but you still don't think that while you're sitting there having breakfast in a nice little sunroom, a real live giraffe will come and poke its head in looking for something to eat. But it does. In fact it does every morning. 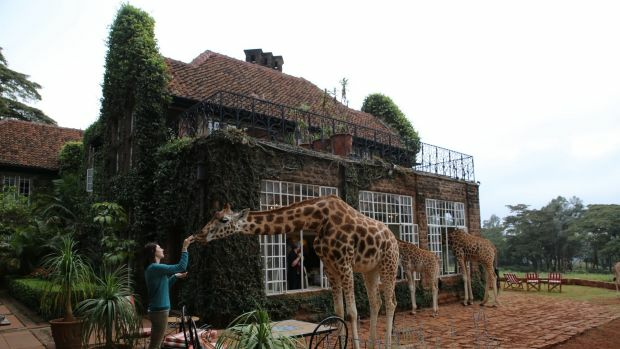 Each day at around 6.30am at Giraffe Manor in Nairobi, those eponymous animals make their way slowly up from the bottom of the garden in search of something good to eat. While the hedges taste pretty good, and the ivy clinging to the walls of the colonial manor house are also worth a munch, the real prize here for our long-necked mammalian friends is a pellet of grass clippings mixed with molasses – and they know just where to find it. That's why seven endangered Rothschild giraffes are coming loping up towards the sunroom this morning, enticed by the rattling of bowls and the hubbub of diners. This is one of those unique moments in travel that you'll never forget: watching as the window space is filled with the brown and beige blotches of a giraffe torso, before a huge head, with those long, delicate eyelashes, those small horns, that pointed, sandpapery tongue, is gently lowered into the room in search of some food. Breakfast with the giraffes. 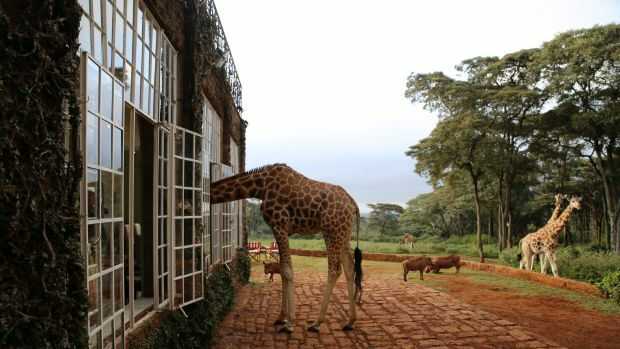 It happens every morning at Giraffe Manor, a boutique hotel on the outskirts of Nairobi, a former mansion turned giraffe sanctuary turned tourist attraction. There are up to 15 giraffes living here at any one time, roaming around the 115-acre property most of the day, browsing on trees and shrubs, getting ready for their two trips up to the mansion. They arrive each evening for sundowners, when the hotel guests all gather on the patio out the front of the house to drink gin and tonics and hand-feed a few animals. And they arrive each morning to stick their heads through the window and see what's on the breakfast buffet. 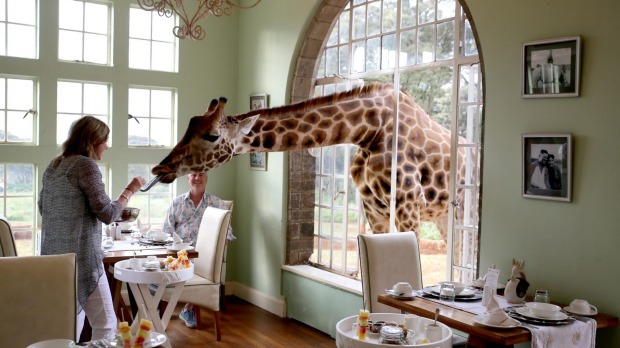 This hotel would be a major attraction even without the giraffes. It's within striking distance of Nairobi airport, and the city centre, while being a quiet sanctuary not just for the giraffes but for travellers looking for a break from the bustle of the city around them. The manor itself is more than 80 years old, modelled on a Scottish hunting lodge, a grand old place of sweeping staircases and creaking floors. 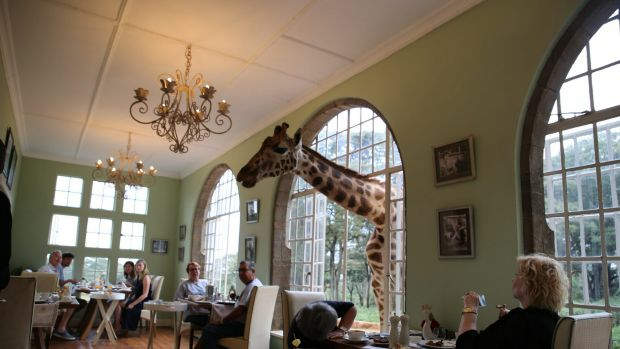 As a guest you have the run of the joint: sit by the fireplace with a whisky, or take tea in the sunroom, or sit in the garden or on the patio and look out for the heads of giraffes in the distance, searching through the foliage. Everything is included here: drinks, breakfasts, dinners served family style around a large wooden table, snacks, and accommodation in classically furnished rooms, the sort of places you could imagine the rich colonists of the 30s and 40s gathering to compare tall tales (which, of course, they did). Nowadays though, everyone is here for the giraffes. After an afternoon check-in, the first time you're likely to encounter them is in the evening, when they lumber in for sundowners. There's a very particular feel to a giraffe tongue, as it turns out. It's rough, like sandpaper, dexterous but huge. Like a snake. You stand there on the patio, pellet of grass and molasses in hand, arm outstretched, and one of those tongues whips up and grabs the pellet before you've even realised what's happening. If you stop the constant supply of pellets, the giraffes will let you know. One bobs its head furiously up and down when I turn to chat to someone and forget for a second that my job is feeding. This experience, however, is only a taster of the big event. That occurs the next morning, when all of the guests wake up early in anticipation. Some gather on the balcony above the sunroom. Some are in the garden patio. Some are in the breakfast room, waiting for those brown and beige masses to appear. And inevitably they do. There are seven on the morning I'm there. A few wander over towards the patio, one nibbles ivy off the manor wall, and three or four come and poke their huge heads in the window to see what's happening. They bob their heads. They blink their huge lashes. It's rare you get an interaction with animals like this, that you get to see such amazing creatures up close. It's even rarer that you get to do it while eating banana muffins and eggs benedict. You don't think it will actually happen – but it does. Every morning. The Classic Safari Company has three-day, two-night packages at the Giraffe Manor, including full board, daily breakfast and high tea with the giraffes, sightseeing tours around Nairobi, and return airport transfers, for US$1300 per person. See website above.